The module worked fine for the first time, and it has received the AT commands and responded back. When I powered off and again powered on the ESP module it seems not responding to AT commands and blue and red LEDs are constantly ON. - Thu Sep 13, 2018 3:22 am #78211 Looks like you've blown up your ESP. Please note that the ESP works on 3.3V only (this includes both VCC as GPIO): it's not, I repeat not 5V tolerant. 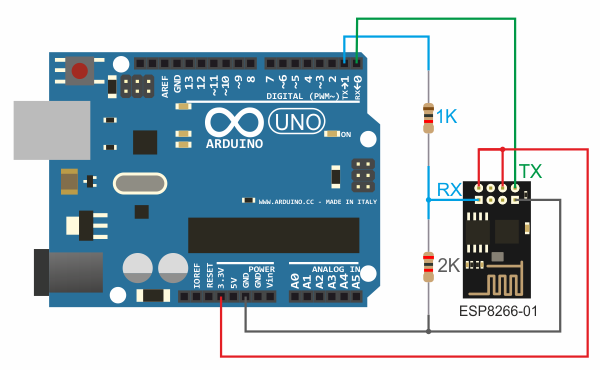 An Arduino works with 5V levels and will eventually fry your ESP when you directly connect Arduino I/O pins to the I/O pins of the ESP without level conversion (even a simple voltage divider might suffice). Please note this thread from a couple of days ago, of someone with a similar problem. As another tip (it's also in my signature for a reason): when you're new to the ESP, first get yourself a development board; it will make your life so much easier and a complete board is equally cheap as a separate ESP-module. Also the ESP8266 is a magnificent chip which is (at a lot of points) more powerful than an Arduino; most applications can be made with only an ESP without the use of an Arduino at all. Since communication over AT is cumbersome not having to interface two microcontrollers is a big plus as well. And the best part is: you can also write code for the ESP with the Arduino IDE and ESP-core. Many thanks for your reply. I tried as you suggested with a new ESP module and voltage divider circuit as shown below, instead of 0 and 1 pins in the Arduino I connected them to 10 and 11 pins as my code initiate a serial port through 10 and 11 pins. Even for this connections also the module worked for the first time and when I powered off and again powered on, the module stops responding to AT commands. I found in some articles that ESP module will have boot modes (UART and Flash boot) depending on GPIO pin configurations. I haven't used any of these GPIOs in my circuit. Does this affect the module? If you have any working model, can you please share the connection diagram of the model. I want to test the ESP before going to FPGA implementation. Thanks in advance, please share if you have any working model circuit diagram.